As we know Granite is the Queen of Stone and it is fit for any commercial and residential flooring purpose. It is extremely durable and adaptable in all over the world. It is easy to install and fit for any flooring work. So it’s call as a smart flooring choice to give your home a luxurious look. As a long runner on this track, I am physical with granite tile and have 20 years working experience so like every story have two aspects, good and bad. In the same way granite flooring have also it’s great and bad experience So as per me you must aware from this before going to buy granite flooring tile. We already discussed about quality of granite tile along with its safety. So you may review our previous post. Granite’s exceptional durability is one of the prime reasons that people choose granite tile for counter tops. Let be a knife, cookware of chairs and tables, with granite, you don’t have to worry about any damage. Thus if longevity is in your mind then granite tiles and slabs can surely be your first choice. If you are planning tiles for the wet areas in their homes like a bathroom or any area that faces heavy moisture or water, then you can choose granite tiles for sure. Granite tile creates a surface that’s practically impenetrable to liquids. Even standing liquid won’t harm your floor. However, a polished granite surface can get quite slippery when wet. So it is always advisable that you mob the wet floor for your own safety. Granite tiles are hypo allergic as it does not have micro pores or grooves. With regular sweeping of your granite tile flooring, you can easily avoid and keep at par pet dander, dust, dirt, and other common allergens. Thus for people prone to allergy or asthma, granite flooring is a good option. Granite is a heavy material and this can be a problem for some floors. Not all types of a base floor can support. A square foot granite tile with a .75-inch depth weighs about 12.8 pounds. A slab measuring 1.25 inches deep weighs about 18 pounds. Thus you must talk to your builder to know the technological aspect of your floor before planning a granite flooring. Or else installation of granite flooring can cause damage and even hairline cracks. Putting up such heavy stones can be a rigorous job. However, we at marble warehouse have a solution for all installation related hindrances. Our experts along with various technological advancements make granite tile installation easy and hassle-free. We at marble warehouse belief in delivering your every wish with a smile. Regular maintenance of granite flooring is necessary for maintaining its quality and shine. It needs special dedicated care. However, to make your job easy, we at marble warehouse bring to you various granite wash care options, regular usage of which can help you maintain the quality of your granite tiles and counter tops. Also, Marble warehouse has a dedicated team of technicians who can go to your home for floor servicing any time you need. Thus it can be seen that Granite tiles and flooring have a heavier pro-list than cons. 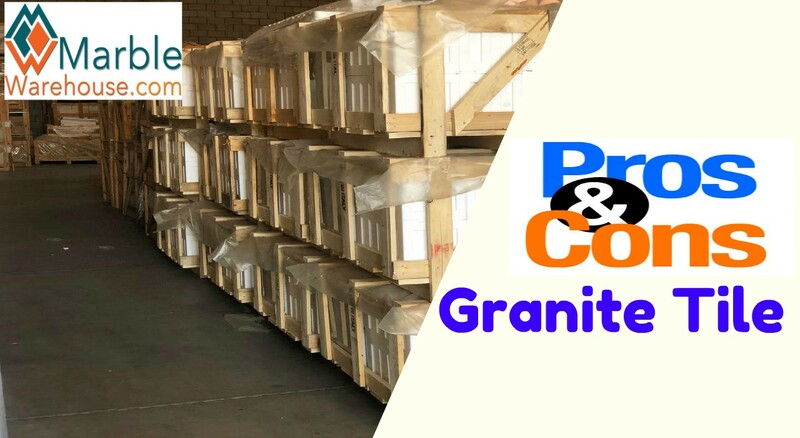 So if installation and maintenance are not issues for you then you can definitely go ahead with granite tiles for your flooring for your home and office.